For navigational searches, the top result is the only result that matters. If you search for [NASA], it's clear that you want to go to NASA's website. Google realized that people sometimes want to go to a specific section of a site, so it started to include sitelinks, an automatically-generated list of popular places from a site. The links are not always the best, but they might save you a click and some time spent on sites that are difficult to navigate. Some sites include a lot of content and their search box is more important than a navigational menu. For these sites, Google has just added a site search box below the sitelinks that allows you to restrict your query to the first search result. The search box shows up for a small number of sites like: Flickr, YouTube, Metacafe, Amazon, Craigslist, SourceForge, Microsoft.com, which have been automatically selected. In the last two years, Google experimented with a lot of ways to enhance the information about search results and it will be interesting to see what features proved to be useful. Update: It's worth mentioning that Yahoo also shows a site search box, but only if you search for [YouTube]. 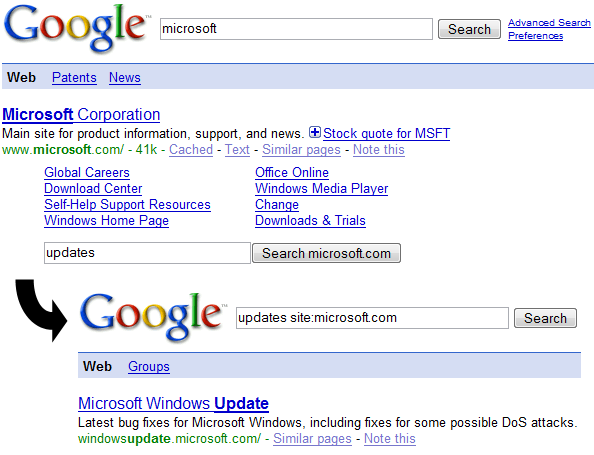 If you dare to search for [Google], Yahoo is there to mislead you. Update 2. Google explains: "Through experimentation, we found that presenting users with a search box as part of the result increases their likelihood of finding the exact page they are looking for. So over the past few days we have been testing, and today we have fully rolled out, a search box that appears within some of the search results themselves. This feature will now occur when we detect a high probability that a user wants more refined search results within a specific site. Like the rest of our snippets, the sites that display the site search box are chosen algorithmically based on metrics that measure how useful the search box is to users." I searched for Youtube, the sitebox doesn't show up yet. I hope they make this option available for everyone. We can also do this with site:youtube.com video. There is a correction in my previous comment. We should use the following to search at a specific site. they are coming back with strong products.. I think so, never substimate to Yahoo, they are very motivated. www.juegosenmovil.com - Free Games and Software for mobiles. "Now we know what the hell you are looking for on other sites, ho, ho, ho!" Sounds like an excellent idea in the fact that it saves a step. Instead of having to go to the page and then run a search you can do a site search straight from the results page. Makes sense that this feature is only available for major sites. Google should probably use page ranking to determine which sites to use this feature on. Damn it will crush affiliates. If google gonna make Affiliate by him self for products in internet? Google Adwords Income Precentage will come down. Everyone will go to Yahoo or Bing.. I Just think that Google MUST NOT do this step. Just make what you do the best. Search results. Don't try to go to affiliates words. You live with it. If the world of affiliates will stand against google, It will be total cruch of Google Adwords.